The required files for these secured sections of the website will be put in directories protected1, protected2, and protected3, respectively. Most of the other authentication schemes work this way. But why is the preceding code not suitable for most websites? This way, you can protect only one page at a time, making the use for it rather limited. Most of the other protection mechanisms work for whole directories. The Apache Web server offers access control to the website using a file called .htaccess. In this file, you can provide information about who may access the website (or the current directory and its subdirectories, if you put the file in a subdirectory of the Web server), among other things. 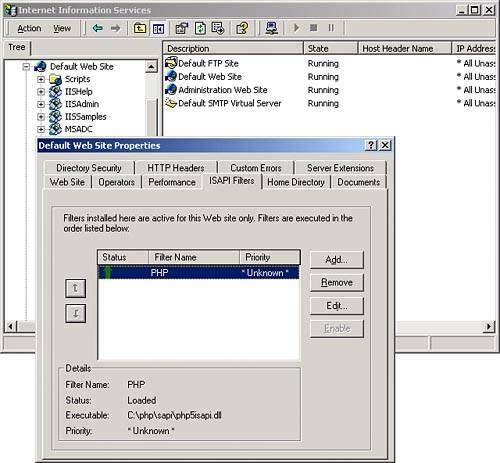 AuthName "PHP 5 Unleashed Protected Area"
Other types of authentication are available, most notably digest authentication, which, however, is supported neither by old versions of Internet Explorer nor by recent versions of Netscape. We will cover this users file in a minute. Also, you need to tell Apache which users are allowed on your website. A good start is to allow all users that are defined in the users file. On Windows, files that consist only of an extension (such as .htaccess) are not allowed, so you cannot use an .htaccess file there. However, if you want to develop on a Windows machine but the Web server is a Unix/Linux machine, just create a file ht.access (or any other name), copy it to your Web server, and rename it there to .htaccess. Now, all files called ht.access will be considered as access control files. Note that you have to restart the Web server before these changes take effect. in httpd.conf and restart your Web server. 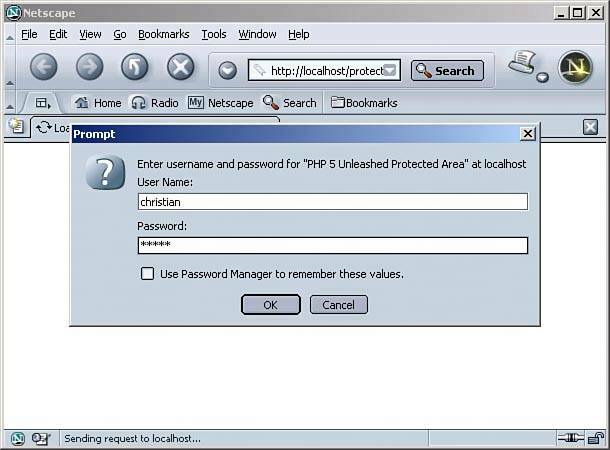 Figure 11.1 shows the browser's prompt for the user credentials. Figure 11.1. The user is prompted for a name and a password. It is restricted to the Apache Web server. Quickly adding users is a tedious taskeither htpasswd must be called using shell_exec() or system(), or passwords must be manually encrypted using PHP's crypt() function to automate the process. 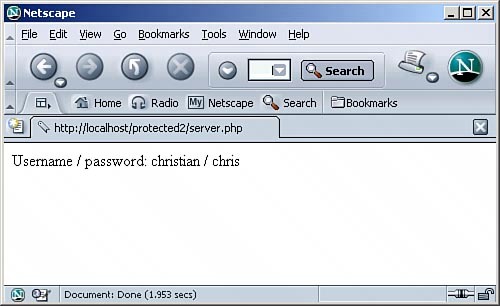 Microsoft's Web server IIS also supports basic authentication; however, there are no text files containing usernames and passwords, but existing (Windows) users on the system are used. In most cases, this is not appropriate; the next section shows you a way to use a more suitable way to authenticate users with IIS (and with Apache, as well). The title of this section is somewhat misleadingwe were using HTTP authentication in the previous section, as wellalthough with a little help from the .htaccess file. In this section, we will use a similar mechanism, but we won't rely on clumsy user files and .htaccess settings. This time, we will check the usernames and passwords within the PHP code. The 401 HTTP status code stands for "Not Authorized"; most Web browsers then open up a modal window where the user can enter a name and password. Depending on the browser type, this can be done an infinite number of times (Netscape browsers) or three times until an error page is displayed (Internet Explorer). For the next examples to work, PHP must be run as a module, not in CGI mode. CGI mode will be covered later in this section. Figure 11.2. The user is now logged in. However, when you try to run this script in IIS, you will get into an endless loopyou are always prompted for your password; however, it is not shown in the Web browser. This is neglected by the majority of literature on PHP. You are again prompted for a username and password. After that, the content of the HTTP_AUTHORIZATION variable is displayed (see Figure 11.3). Figure 11.3. The value of HTTP_AUTHORIZATION (on IIS). For this to work, PHP must run as ISAPI module in IIS, and you must install php5isapi.dll as ISAPI filter in the IIS admin console (see Figure 11.4). Also, you must disable Windows authentication in the IIS management console. Figure 11.4. Install the PHP ISAPI filter. Figure 11.5. Now the username and the password are readable. Because a Web browser stores usernames and passwords as long as the browser is not completely closed, be sure to close the browser after each example so that you start fresh without any user names or passwords being submitted. Otherwise, you might not see the pop-up windows for the user credentials, because they have already been sent automatically. Using this code as a basis, HTTP authentication can be implemented rather easily. In Listing 11.7, the secret area is protected using one username/password combination: php5/iscool. Only if the user enters the right credentials, the 401 Unauthorized HTTP header is not sent out to the client. To protect a site, just include the preceding file in all pages you want to secure. Alternatively, you could use the auto_prepend_file setting in php.ini! 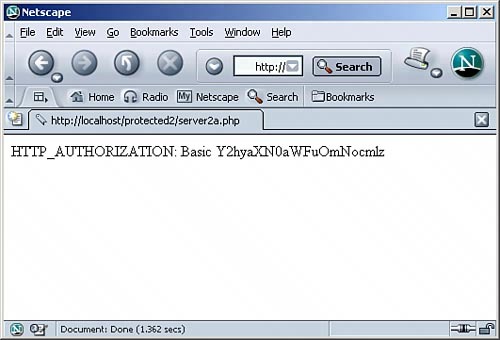 The encryption is done using PHP's crypt() function. As a first parameter, the password is submitted; as a second parameter, we use the string constant "pw". echo htmlspecialchars($_POST["user"]) . ":" . Figure 11.6. Users can be added to the users.txt file. This example is kept as easy as possible; therefore, some special security prerequisites have not been established. 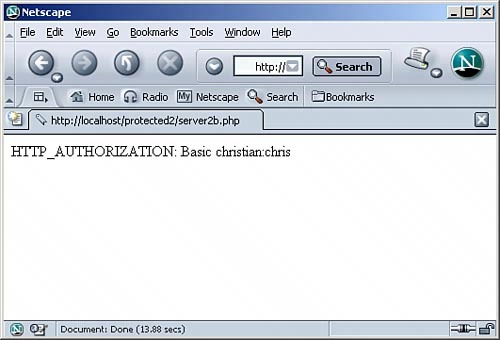 In a real-world application, you have to secure this script so that only you have access to it. Furthermore, the user/password file must not be readable for all users; especially, it must not be downloadable using a Web browsermove it outside the Web root. As soon as some users are added, it is time to create a script that checks whether a given username and password exist in that filethat is, if the user is known to the system. 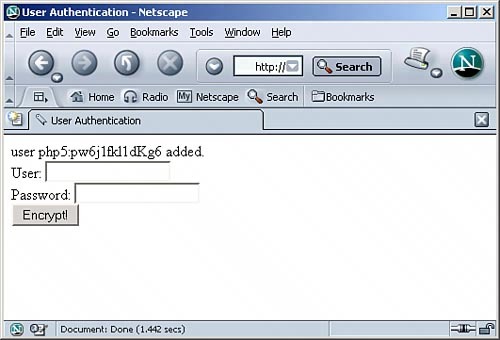 To do so, the username and password provided using HTTP authentication is retrieved as shown earlier. After that, the user file is parsed for this username/password combo. If successful, the user is granted access. Listing 11.9 shows the complete code, which works on both Apache and IIS. An easy mistake: Remember that fgets() reads data until the end of the line, including the "\n" at the end. Therefore, you have to remove this character using PHP's rtrim() function. The more users you get, the less performability this file-based solution will have. After some time, you will want to use a database to save user information. Again, two scripts are generated. First, the PHP page in Listing 11.10 lets you add users to the database. The database is called auth; it contains a table users with at least two fields, user and pass, both VARCHAR(255). mysql_query("INSERT INTO users (user, pass) VALUES ('" . The main advantage of this solution is that now you do not have to worry about things such as file locking and parallel access to the file users.txtthe database does this automatically for you. Lean back, relax, and let your users authenticate themselves. If the Apache module mod_auth_mysql is used, the whole management and checking of usernames is even easier. The module was written by one of PHP's main developers, Zeev Suraski (the "Ze" in Zend). As of the time of writing, it is available at http://www.mysql.com/portal/software/item-241.html, but it works only on Unix/Linux. The File USAGE contains information about installation, preparing the MySQL database, and incorporating the module into your Apache Web server. They require that you have certain rights on your Web serversomething that is not true with many hosting packages. They do not work in CGI mode; especially under Windows, some people still do not dare use the ISAPI module of PHP (the author of this chapter gets nervous, too, after he learned some things about the stability of this module with an older PHP version at a presentation). One thing that always works is the use of PHP sessions. The information about whether a user is authenticated is saved in a session variable. Thanks to PHP's session management, this information is then available on all pages of the Web application. PHP's session-handling functions are covered in great detail in Chapter 6, "Persistent Data Using Sessions and Cookies." The path where session data is written to must exist and be writeable for PHP (session_save_path). Set session.user_cookies to 1 so that PHP always tries to set a cookie with the session ID. This makes the application more secure. Don't worry if the client does not accept cookies; the session ID is passed on using the URL. If you need session-based authentication on all pages of your website, set session.auto_start to 1. If you need this authentication on only some of your pages, you should start sessions only on pages that really rely on it, using session_start(). Again, we start using a simple example where only one username/password combination is valid. The session variable username will contain the username of the currently logged-in user. If this variable does not exist, the user is not logged in. On the other hand, if the variable does exist, the user has successfully logged in. After the user submits the HTML form, the name and password are checked. If the credentials are okay, the user is logged in. You must not forget that you have to set a session variable to save this "logged-in" status. Listing 11.12 contains the complete code for the login page. This works well; however, to modularize the whole login process, the user should be redirected after successfully logging inbut where? This is where another nifty trick comes in. When linking to the login form, we submit the following as part of the URL where the user came from: http://servername/login.php?url=/path/to/origin.php. If this value is not set, however, the user is redirected to a file index.php. session_name() returns the name of the PHP session (for example, "PHPSESSID"). session_id() returns the session ID (for example, "18143b51ee37ac73cea81cd19ba20f2c"). If a session cookie exists, that is, if $_COOKIE[session_name()] is set, the user is just redirected. If no session cookie exists, the session information must be appended to the URL. First, it is checked to determine whether the URL already contains a question mark. If so, "&" . session_name() . "=" . session_id() is appended (for example, "&PHPSESSID=18143b51ee37ac73cea81cd19ba20f2c"). If no session cookie exists, and the redirect URL also does not contain a question mark, then "?" . session_name() . "=" . session_id() is appended (for example, "?PHPSESSID=18143b51ee37ac73cea81cd19ba20f2c"). header("Location: " . $url . The rest of the code is standard procedure: An HTML form accepts a username and password. Upon submitting this form, this information is checked against "php5"/"iscool". Upon success, the redirection URL is determined. Either, $_GET["src"] is set, or the standard value, "index.php", is used. Figure 11.7. The login pagethe referring page is seen as part of the URL. In this section, we will create several login pages. If you want to use one or another, you have to rename the file you want to login.php so that it is automatically called by the preceding code. Include the preceding code at the beginning of each PHP page you want to protect, before any HTTP output is sent (required for the session handling). You can use include(), require(), or require_once(). Include this code to all files, using auto_prepend_file in php.ini. However, before you do that, extend the code so that it checks whether it is called on a page called login.phpthe login page must be accessible without providing a password! If you have MySQL at hand, you can and you should store your users in the database. This makes handling users (including adding, modifying, and even deleting) much easier. Not sure what MySQL is or how to use it? Chapter 23, "Introduction to Databases," is a complete introduction to relational databases and Chapter 24, "Using MySQL with PHP," deals specifically with MySQL. The rest of the code is the same as before. The session variable is set; then the user is redirected. If necessary, the name and ID of the current PHP session are manually appended to the URL. This approach is in no way restricted to the MySQL database. With very few changes to the code, this code can be adapted to PostgreSQL, MSSQL, or any other data sources. If you were using the PEAR::DB classes, this task would be limited to changing one line in the codewhere you provide the information about the connection data for the database.